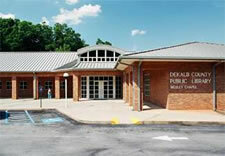 Every library building and community is different and the library's design should reflect that. I've had the pleasure of working at several libraries, all different in design and type of community served, but they each taught me one valuable lesson - it's what's on the inside that counts. Whether you are in a brand new, state-of-the-art building, a historic piece of architecture, or a converted building, you probably have little control over the physical structure of the building. That's okay because you can definitely take advantage of the inside. Community standards play a big role in libraries - it affects the books we purchase and the programs we offer - so it stands to reason that the design of our buildings should actively reflect those same community standards. Take, for instance, the design of the Seattle Public Library's Central Library and its very contemporary design. From the architecture to the interior design, the style reflects the community standards. Obviously this type of design wouldn't go over as well in a small town community (not even considering the budget constraints,) but for a city that is known for its modernity the design is just right. The library you work in, however, is most likely to resembles the picture above. An older building, true, but still full of potential on the inside. If you work in an older building - don't fret too much about the outdated exterior - take control of the interior. Considering the community standards, think about how these interior designs may (or may not) fit. Contemporary - Probably the most used design style in libraries today, this style is often a safe bet because it is, well, contemporary. 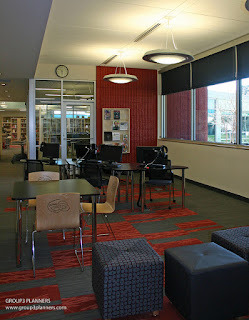 Defined by the styles of the current time, libraries often incorporate sleek furniture and lighting like you see in the picture to the left. This look comes standard on most newly built or renovated libraries but there is no reason to not put this style into a building like the one above. Because it is more cost effective to make cosmetic changes than build a new structure, bringing the interior into contemporary design is a great way to keep the library relevant. Traditional - Of course, it may be that your community is not ready for a contemporary design. That's okay, because we are designing our library based on community standards. For this community you may want to take a traditional approach. The traditional style focuses more on color and comfort than anything else. Think of your living room and try to invoke some of the same emotions. Rustic - A design that is exactly what you think it is, uses darker hues along with wood and metals such as iron and copper. 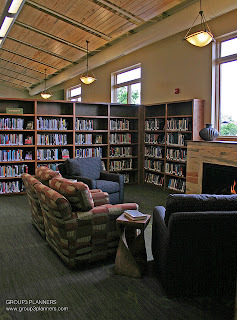 In this library in Colorado, the carved wood for the side table and cozy fireplace to read books by are signature features of the rustic style. Modern - I referenced Seattle's main library before and that's because it has been the point of reference for modern library design over the last couple of years. Modern is a term that was coined in the 1920s and we still seem to use it to describe "forward thinking" design. Modern is definitely not for every library, but certain additions of furniture or bold/bright colors will certainly modernize a library and bring it into a contemporary design. Knowing these different styles is important if you want to design by community. Following the belief that "form follows function," a term coined by the Bauhaus, it is important to understand what your community's expectations will be. 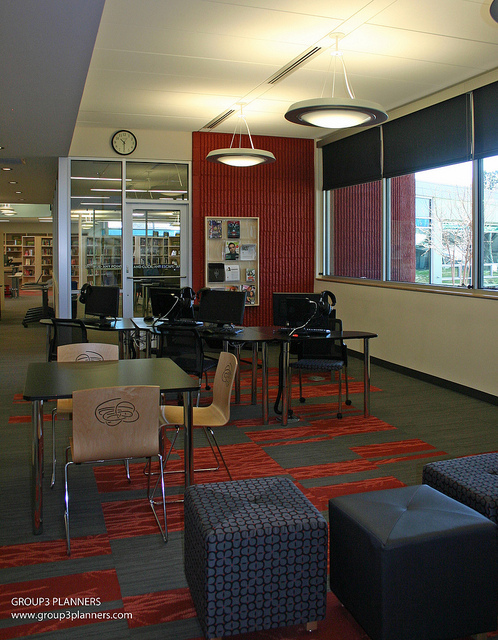 After you've thought of the overall concept for your library, you can begin to consider spacial function and how the community will actually use the space. We'll cover that on the next post - Library Design 101: Logical Arrangements.